with his signed Airwolf Extended Themes 2CD. South African Airwolf fan, GÉRANN GERBER decided to take a Winter holiday vacation (remember it's Winter in the Southern Hemisphere when the rest of us in the North are basking in the Summer sun!) across the warmer climes of Europe. 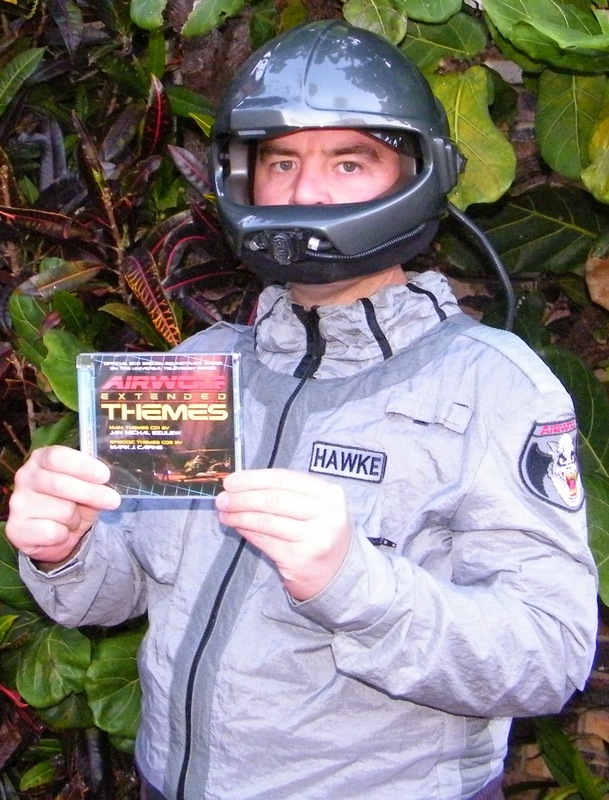 As he'd already bought a copy of the all-new Airwolf Extended Themes 2CD earlier in 2014, album producer Mark J.Cairns had signed the inside back cover of the original copy for him at the time of order. 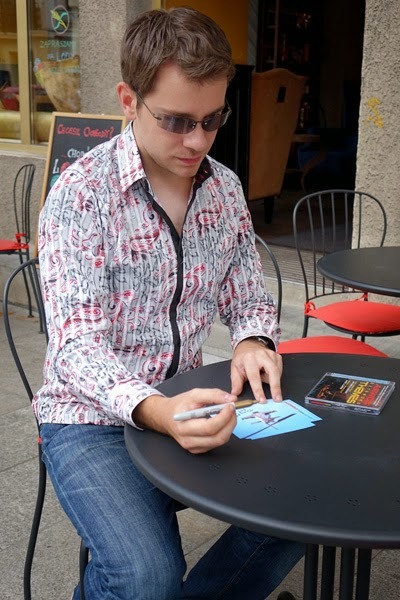 Well, Gérann decided that he wanted to complete the set properly so he booked an extra stop-over in Warsaw, Poland and arranged to meet the album's Orchestrator and Associate Producer, Jan Michal Szulew to have him sign his original copy as well. 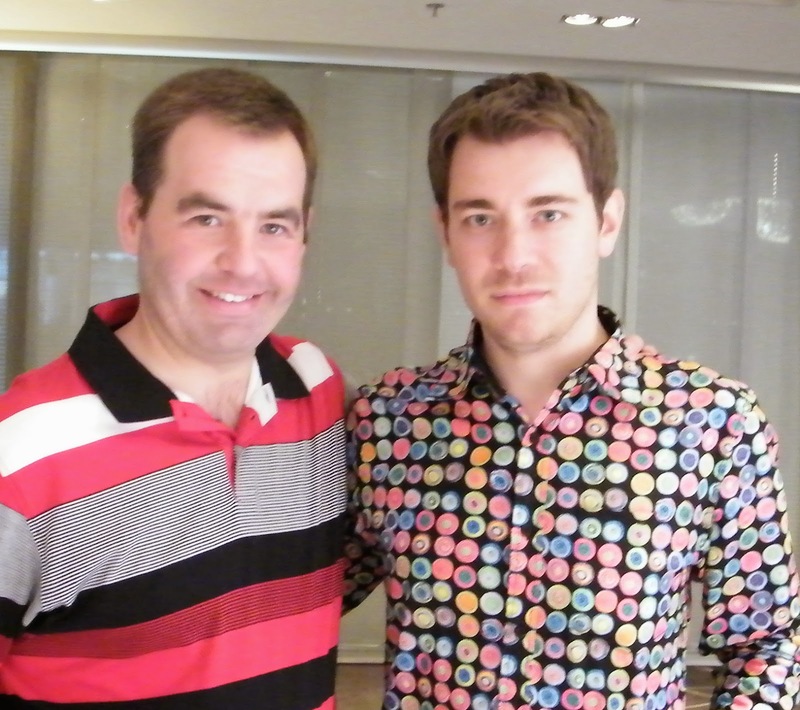 Meeting up in early August 2014 at one of the main central Warsaw hotels, the two guys talked for a couple of hours about, amongst other things, music and naturally the Airwolf Extended Themes 2CD album that was released this year to critical acclaim by the Airwolf fans. Gérann was interested to learn more about the difficulties in producing something as huge as the production of this album and Jan explained how time-consuming (years!) it had been to create and produce the music for the album especially as his contribution had totalled 22 tracks, filling an entire CD. Jan expressed his immense admiration for Sylvester Levay's iconic theme tune for the show as the conversation progressed to the earlier visit with the Airwolf Documentary team to meet Sylvester Levay at his home and studios in Munich, Germany during January 2013 and some of Jan's experiences that day. After that they took a quick trip into the city to visit some of the local stores allowing Gérann to experience the noise and bustle of the local Metro (Jan helped him speed up the process at the ticket vending machine). 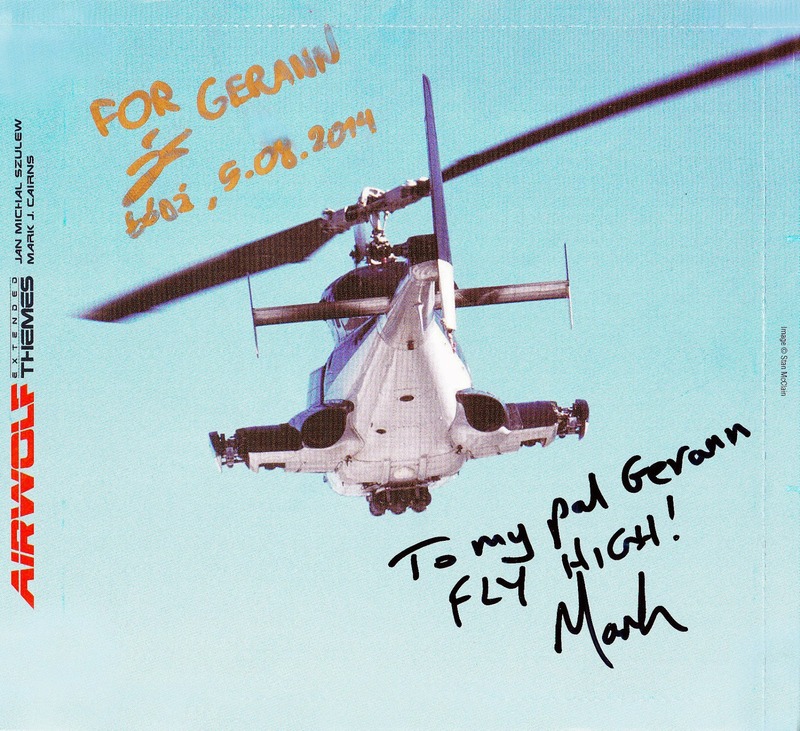 At a local coffee house Jan then signed the inside back cover of the Airwolf Extended Themes album and granted Gérann his wish to have the only copy in the world to be signed by both Mark J.Cairns and Jan Michal Szulew. Gérann commented: "The day was a wonderful experience and an absolute honour to meet Jan for the first time. I also made sure to give him a traditional gift in return from my part of the world in South Africa, via a 'Big Five' [lion, leopard, elephant, buffalo and rhinoceros] photographic puzzle as a little memento of my visit to thank him for the help and generosity of his time shared with me. I really appreciated it." Jan Michal Szulew later commented: "It was a pleasure meeting Gérann and really quite surprising to me that he made the long trip all the way up from South Africa to meet with me and have his copy of the album signed." It's not every day that a music fan will travel half way around the world for a signature on a music album, but Gérann loved the experience of it and it certainly made for an interesting and memorable diversion for a day during his Winter holiday trip 2014. 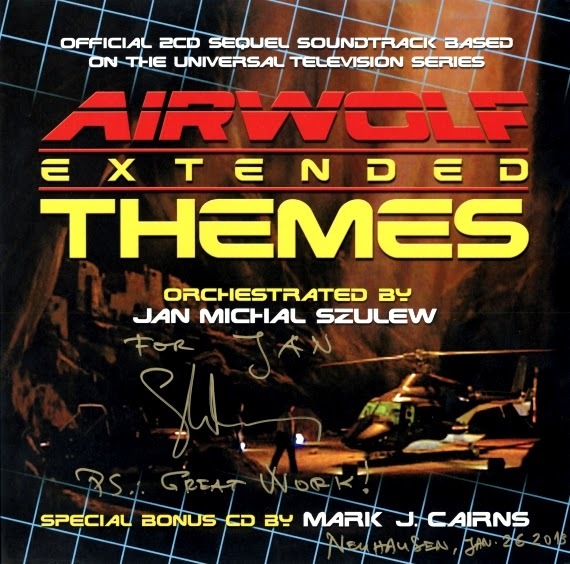 If you haven't experienced the Airwolf soundtrack yet, you can still buy original 2CD sets directly from the Airwolf Themes team via their official website here. Sylvester Levay signed artwork used the same gold Sharpie pen that Jan used to sign Gérann's CD artwork. Text and Images are Copyright Mark J.Cairns © 2011. 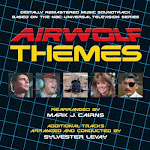 Airwolf Themes is Copyright GER Soundtracks ©. Awesome Inc. theme. Powered by Blogger.